While no one is ever completely safeguarded from water damage, there are some preventative measures that 911 Restoration Los Angles recommends you take to minimize your risk of experiencing a water disaster. Ensure that your gutters and downspouts are clear. If they are clogged with leaves and other debris, water will not move effectively away from your roof and foundation. This can lead to roof leaks and a flooded basement or crawlspace. Be sure to regularly inspect your appliances as well. Water heater leaks or ruptured hoses on a washing machine can result in serious water damage. Look for rust or pinhole leaks; these things could turn into bigger problems if they are not taken care of. A small pipe burst or rain leak may quickly turn into a flood cleanup job. If you do experience flooding, turn off your electricity in the affected area as a safety precaution. Move belongings and furniture away from the water, but only if you can do so safely. Our water damage Los Angles team will be there fast to perform the best disaster restoration in the business. When it comes to water damage and restoration Los Angles problems every second counts. 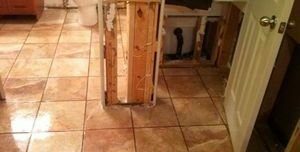 911 Restoration Los Angles is here to provide the best water damage restoration services in the Los Angles area, so call us at the first sign of trouble! In colder climates, the staple advice is to insulate your plumbing for the winter, since winter hardly exists in Sherman Oaks, the go to advice is to have an annual inspection to check for damage excreta. A dent in a line could cause a clog resulting either in sewage backup filling your property with deadly black water, or a pipe burst, drenching the building in irritating gray water. Either way, the results are not pretty, until 911 Restoration Los Angles and our water damage Sherman oaks team cleanup the mess, that is. A professional checking the pipes is ideal because they can see infrared cameras to find leaks, and have years of experience e looking for issues that could turn into bigger problem. When you call our 24/7 support, we can walk you through the steps while our technician is on the way because our customer support is out of this world. The number 1 way to reduce the damage to your home from plumbing is to understand where your water shut off is and how to close the valve. This can stop the disaster from enveloping your entire house. Our water damage Los Angles team knows from years of experience that when it comes to a home disaster there’s no time to lose. We respond to all water damage emergencies within 45 minutes, so you can rest assured that you will have the help you need when you need it most. Once we arrive we begin with a free inspection to assess the damage and formulate a full restoration plan, and out water damage Los Angles techs will be happy to answer all of your questions regarding our process. 911 Restoration is here for you day and night to get you through any water damage disaster in your home or business. By providing same day service you will be on the path to a full recovery in no time. From flooding and rain leaks to sewage backups and fire restoration, we are the only call you need to make to get your life back to normal as quickly as possible. Our licensed, insured and bonded team is the best in the business. 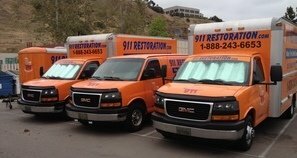 Call our water damage Sherman Oaks team with 911 Restoration Los Angeles and get the help you need fast today!